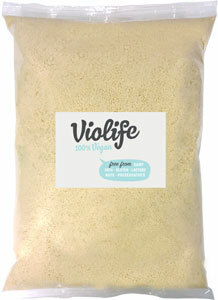 Violife's perfectly delicious and essential vegan Parmesan is now available in grated form for easy kitchen applications, saving you plenty of time and cleanup! Perfect for topping off pizzas and pasta dishes, risottos, appetizers, salads, soups, nachos or anything else that's even better with a healthy helping of vegan cheese, Just Like Grated Parmesan will transform your meals into an authentic Italian meal. Each bag is 1.1 lbs. (500g). $14.99 per package. From Evelyn Porter of Pearland, Texas on 9/28/2018 .